Debunking Christianity: Did Jesus Predict the Resurrection? Did Jesus Predict the Resurrection? Believers claim that the resurrection not only happened, but did so in accordance with what Jesus taught his followers about himself and his mission. And there are several passages in God’s supposed autobiography that back up this claim. For example, Matthew 16:21 states that Jesus told the disciples he must go to Jerusalem to be killed “and on the third day be raised.” And in 27:63-64, the priests tell Pilate about the prediction, and suggest that the Romans guard the tomb lest someone steal the body to make it look like it came true. Supposedly, then, Jesus’s followers expected the resurrection, and many of his enemies knew about this. But now imagine that that had indeed been the case. What would have been the result? I think the answer is obvious: There would have been quite a few people hanging around the tomb waiting to see what would happen. Even the disciples would most likely have come out of hiding for a chance to see the wondrous event — the single most important one of their entire lives — especially if they could have done so by blending into the crowd. And Mary and the other women who came to the tomb afterwards would definitely have been there earlier. 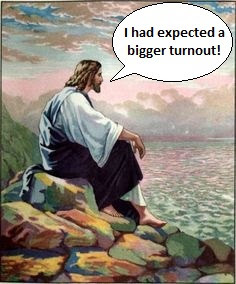 Instead, according to the scriptures, no one went to see if he would come out as he supposedly predicted. Not a single person could be bothered to do so. Why not? And why, when they found the tomb to be empty, were all of them in disbelief? Could it be that the stories of Jesus predicting his coming back to life were made up later? Could it be that some of this stuff isn’t actually true? Shockingly, the answer appears to be yes.